That Timothee Chalamet Best Actor Oscar nod was no fluke. A year after his tender turn as a teen coming to grips with his sexuality in Call Me by Your Name, he amazes again. And it must be noted that his role as an affluent, spiraling junkie named Nic Sheff is just as demanding. 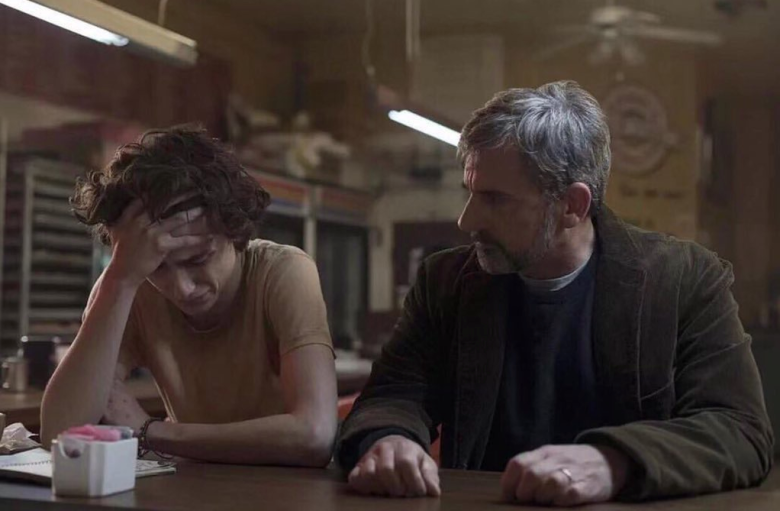 The big difference is that his film, Beautiful Boy, is slick sentiment dressed up as a Big Intense Tearjerker. Mistake No. 1 is that we’re not on Nic’s turbulent journey to the bottom and back. This is a family drama based on their respective 2008 memoirs: David Sheff’s Beautiful Boy: A Father’s Journey Through His Son’s Addiction, and Nic’s Tweak: Growing Up on Methamphetamines. It’s clear early on that this film isn’t nearly as interested in the twisted pain that is addiction as it is in the warm and fuzzy father-son bond. David Sheff (Steve Carell) appears first, in a pre-opening credits sequence in which he interviews a doctor (Timothy Hutton, hopefully cast in a nod to Ordinary People) about causes of addiction. The camera zooms in tight on his concerned, lined face. David is an investigative journalist by trade, but this talk is personal. His son Nic is in trouble, quickly succumbing to a deadly habit. He’s just here as a curious parent seeking answers. We’ll circle back to the same interview mid-way through the non-linear Beautiful Boy narrative. At this point, Nic will have tried hard drugs for the first time and lie to family about it. I’m hard-pressed to recall other significant milestones. The movie, like Nic, seems to fade in and out, aimlessly wandering around without sturdy support. We get multiple perspectives and time shifts. Flashbacks layer upon other flashbacks in scenes set in bright natural light, similar to what director Jean Marc Vallee pulled off in Wild. One moment focuses on Nic convincing his dad to send him away to college even though he’s newly sober. In the next, David is talking to his wide-eyed, curly-haired child in a diner. Amy Ryan, as Nic’s flighty mom, gets her own mini-section. Though it’s more of a stop-gap. Spoiler: Chalamet and Carell eventually hug it out (Amazon Studios). There are also two addiction stories in play: Nic to his drugs and David to his son. No matter how Nic treats him, he refuses to accept that his good little boy has turned into a lying, depressed man. If he accepts his son’s faults, then he must also accept that he is partly to blame for the downfall. The guilt is palpable: David now has a new wife (Maura Tierney, just wonderful) and two adorable young kids that adore their big brother and want him to feel better. David never outright says it, but he wishes he could do things differently. Carell, in his own understated way, is just as raw as his onscreen son. (Admittedly, Chalamet has the showier role.) These are fantastic portrayals. You will care about this family. I kept waiting to bawl at all the despair. It didn’t happen. I think it’s because the earnest and certainly well-meaning Beautiful Boy, for all its artfulness, never reaches a well-earned emotional crescendo. And It rarely strays from a well-honed formula. The rock bottom. The false hopes. The broken promises. When an addict swears to be clean an hour in a movie, an ugly relapse is inevitable. I don’t make these criticisms to belittle Nic’s struggle. I respect what he and David have gone through together. But a film that wears its heart on its sleeve is only as good as the texture of the sleeve itself. A film like Beautiful Boy shouldn’t have to stoop to a mopey rendition of that chestnut “Sunrise, Sunset” as a musical interlude. Let the aching frustration and disappointment speak for itself. Is this the little boy at play? Why, yes it is. Let’s move along.